Ceramic beads have been used in jewelry for millennia. Recognizing the utilitarian quality of this material, Peter Hoogeboom chooses it as the primary material for his neckpieces. Hoogeboom had noted historical ceramic jewelry in museums yet did not often see clay used in contemporary jewelry. Through experimentation he found that the slip casting technique allowed him to efficiently produce a large number of ceramic elements for use in his neckpieces. Speaking of his work, Hoogeboom has said, “In my jewelry, I try to put as much eloquence as is to be found in an Inuit carved horn spoon or in a worn, rattan Indonesian lunch basket.” This simple statement not only describes his jewelry, but his inspiration as well. When not working, Hoogeboom travels and his pieces reflect the images in the world around him. Hoogeboom often uses clay that he finds in other countries, such as a very white clay he discovered in Taiwan. His Dutch heritage, and its long association with Delftware, has also influenced his work. His jewelry can be defined by three elements: simplicity of design, repetition of similar or identical forms and surface texture or treatment. When looking closely at this neckpiece one is struck by its components and the overall design, both of which are contributing factors to its appeal. The title, Desert Necklace, gives a clue to its inspiration. The necklace is comprised of rows of small gourd-shaped vials, each fitted with a cork stopper, reminiscent of gourds and other vessels used to carry water through the desert. One can visualize the vessels holding water, protecting the wearer from thirst. Moreover, the design of the necklace and the arrangement of the elements seem to be a tip of the hat to Dutch history, with the layers of white beads resting upon each other reminiscent of a lace ruff collar common to the region in the late sixteenth to early seventeenth centuries. All in all, this neckpiece is pleasing to both the viewer and the wearer. This is due not just to the source of inspiration, the design, or even the tactile appeal of its many smooth slip-cast elements, but a fascination with perfect reproduction, repetition, and an appreciation for clay, an often overlooked medium in contemporary jewelry. 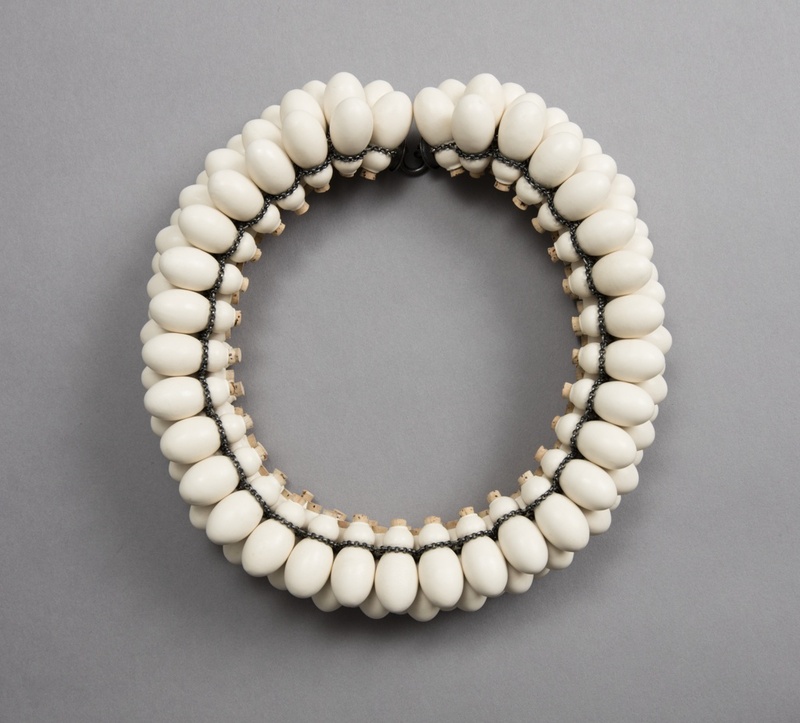 This neckpiece is one of more than 150 pieces of contemporary jewelry featured in Jewelry of Ideas: Gifts from the Susan Grant Lewin Collection, now on view.